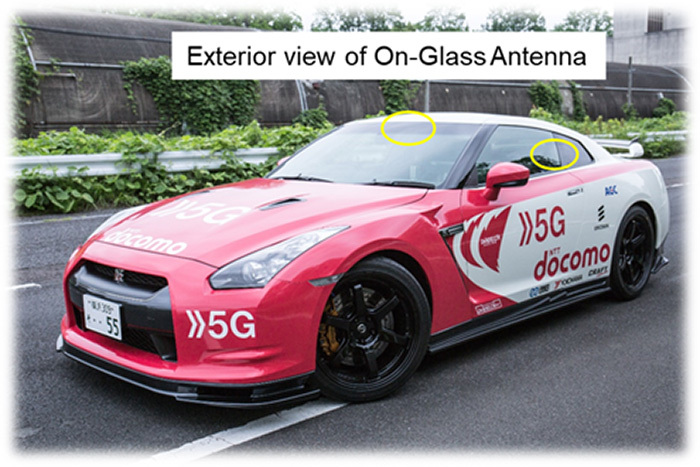 Tokyo, July 25, 2018 --- NTT DOCOMO, INC. (DOCOMO) and AGC Inc. (AGC) today achieved the world's first1 8 Gbps 5G communications with a fast-moving vehicle equipped with "vehicle glass mounted antennas" (On-Glass Antennas) in a field trial conducted in conjunction with Ericsson Japan. Radio waves in the 28 GHz band have a large propagation loss and have difficulty propagating over long distances. 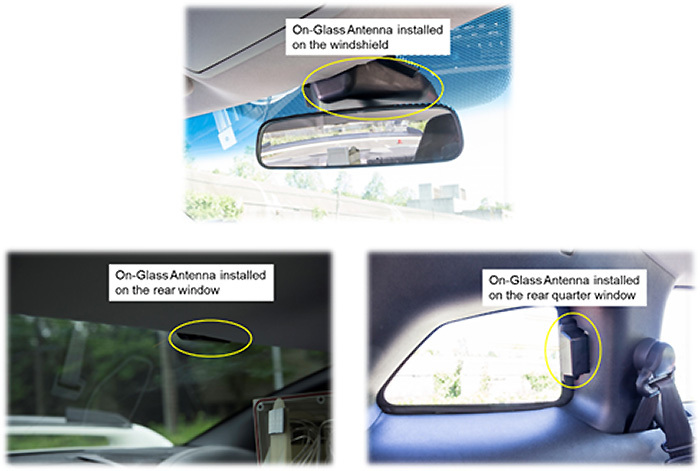 By installing an On-Glass Antenna on the vehicle, radio waves above 6 GHz can be transmitted and received using the "beam forming function", which concentrates radio waves in a specific direction, and the "MIMO function", which improves communication speed by simultaneously transmitting different data from multiple antennas. This allows stable, high-speed communications even for vehicles in operation. 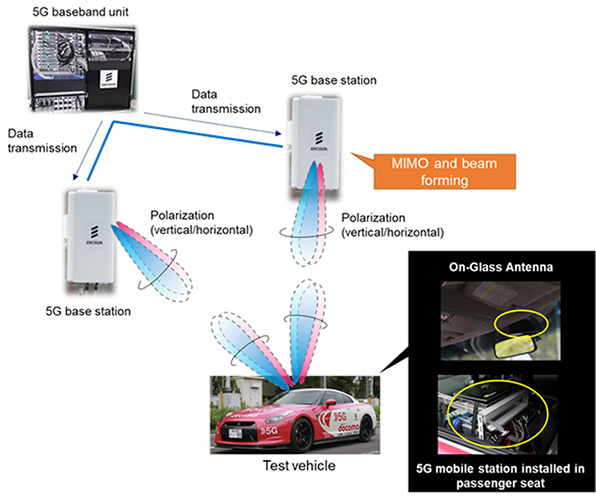 For this field trial, 5G high-speed communications using both the beam forming function and the MIMO function was performed with a vehicle equipped with On-Glass Antennas. 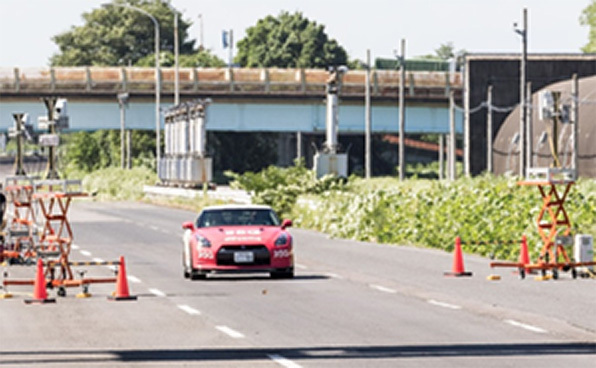 The trial was held at the National Institute for Land and Infrastructure Management in Ibaraki Prefecture, Japan. 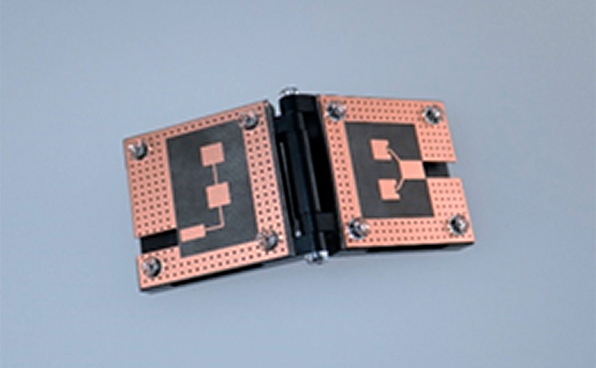 While moving at high speeds of approximately 100 km/h, a maximum communication speed of 8 Gbps was achieved, and a maximum of 11 Gbps was achieved at a speed of approximately 30 km/h, confirming that high-speed in-vehicle communications in the 28 GHz band can be achieved by utilizing On-Glass Antennas. According to research carried out by DOCOMO (as of July 25, 2018). Attachment: Details of 5G Field Trial Using "Vehicle Glass Mounted Antenna"
By utilizing the On-Glass Antennas to receive signals in combination with the MIMO function and the beam forming function with up to four beams supporting vertical and horizontal polarization, 5G high-speed communications were realized, with up to 8 Gbps at a moving speed of approximately 100 km/h, and 11 Gbps at a moving speed of approximately 30 km/h. NTT DOCOMO, Japan's leading mobile operator with over 76 million subscriptions, is one of the world's foremost contributors to 3G, 4G and 5G mobile network technologies. Beyond core communications services, DOCOMO is challenging new frontiers in collaboration with a growing number of entities ("+d" partners), creating exciting and convenient value-added services that change the way people live and work. Under a medium-term plan toward 2020 and beyond, DOCOMO is pioneering a leading-edge 5G network to facilitate innovative services that will amaze and inspire customers beyond their expectations. DOCOMO is listed on the Tokyo Stock Exchange (9437). https://www.nttdocomo.co.jp/english/. AGC Inc. (Headquarters: Tokyo, President & CEO: Takuya Shimamura) is the parent company of the AGC Group, a world-leading glass solution provider and supplier of flat, automotive and display glass, chemicals, ceramics and other high-tech materials and components. Based on more than a century of technical innovation, the AGC Group has developed a wide range of cutting-edge products.